OpenRemote is an open source application which implements touch screen control interfaces for iPhones, iPads and Android devices. It's basically a client-server solution where mobile devices act as clients and OpenRemote Controller is the server. Integration with automation networks and multimedia servers is done through a set of plugins and the availability of configurable protocol wrappers. HTTP, Telnet and TCP commands can be configured to control devices supporting any of these protocols. 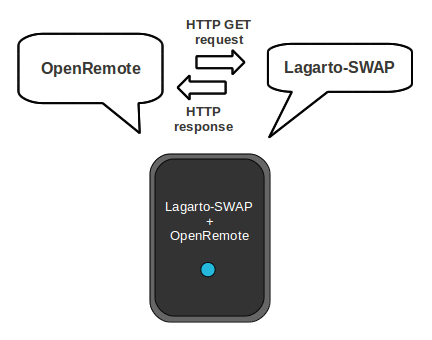 A Lagarto-SWAP server, connected to a SWAP network of panStamps, can be controlled and queried via HTTP GET/POST commands so connectivity with OpenRemote is straightforward. 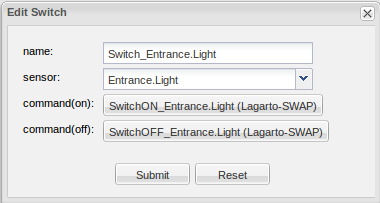 In our example OpenRemote Controller and Lagarto-SWAP run on the same computer for simplicity. 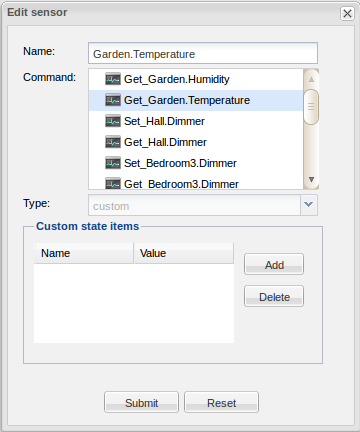 Settings and GUI panels are configured from the on-line Designer tool and then uploaded to the controller through the synchronization embedded page. OpenRemote Designer is one of the key pieces of the solution. This tool lets us create our own graphical panels and program the interaction with physical devices. Graphical panels consist of images, labels, buttons, switches and sliders. Each GUI component is attached to virtual sensors and actuators which send HTTP commands to Lagarto-SWAP. Then, Lagarto-SWAP communicates with panStamps, as explained in the tutorials. OpenRemote commands read and write values from/to physical devices. In our example we have to define a read command for each SWAP endpoint, input or output, and an additional write command for each output. Once the command created, we can attach it to a virtual sensor or actuator. Using remotes is very simple. OpenRemote is freely available from Android and iPhone app stores. After installing the application on your phone you will only have to start it and select the controller previously auto-discovered. Panels are then transferred from the controller to the remotes, ready to be used. The above example is quite modest; just a couple of panels showing and controlling values from some panStamps, but possibilities offered by OpenRemote seem endless.